Protoypes are the early development versions of the video games you know and love. To the right, for instance, you see a prototype of Adventure Island IV. The terrible quality of the photographs in this section is the result of prototype collecting being an elitist enterprise — the only photos we can get are the ones we see in auctions. The Famicom had a number of very usual prototypes. While all NES prototypes were produced using the standard Nintendo carts, for the Famicom, prototypes ranged from the large cart to the right, to the use of the RAM adaptor casing, and for the Famicom Disk System, special white development disks. In addition to prototypes, many companies also released sample cartridges that were used to test the games and provided to video game journalists who reviewed the games. Prototypes and sample carts continue to pop up on auction sites. While protos and samples sell near $100 for the NES, for the Famicom in Japan they sell much more reasonably. It's a prototype from the shady prototype underworld! The Takahashi Meijin no Boukenjima IV prototype comes in a large, blue Famicom cartridge. The ASO: Armored Scrum Object sample game comes in a small, blue Famicom cartridge. 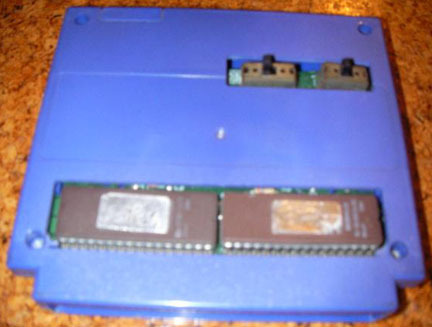 The Double Dragon II prototype comes in a Famicom Disk System RAM adaptor. The Dr. Chaos: Jigoku no Tobira prototype comes on a white Nintendo development disk. The Hokuto no Ken 3 prototype comes in a Famicom Disk System RAM adaptor. The Metal Max prototype comes in a Famicom Disk System RAM adaptor. The Section Z prototype comes on a white Nintendo development disk and a strange label number. The Super Lode Runner prototype comes on a white Nintendo development disk. This unreleased game prototype comes on a white Nintendo development disk. The Labyrinth sample game comes in a small, white Famicom cartridge. The Conflict sample game comes in a small, white Famicom cartridge. The Derby Stallion sample game comes in a small, blue Famicom cartridge. The Tiny Toon Adventures 2 sample game comes in a small, white Famicom cartridge. The Top Gun sample game comes in a small, black Famicom cartridge typical of Konami sample games. The Smash Ping Pong prototype comes on a white Nintendo development disk. The Goonies 2: Flattery Saigo no Chousen sample game comes in a small, black Famicom cartridge. The Salamander sample game comes in a small, transparent blue Famicom cartridge. The Wai Wai World sample game comes in a small, black Famicom cartridge. The Twin Bee sample game comes in a small, black Famicom cartridge. The Goonies sample game comes in a small, black Famicom cartridge.